We went to the doctor’s office today for our regular appointment and I mentioned that the Robaxin that he gave me for my back pain wasn’t helping at all. That is a muscle relaxer and I don’t think the problem is in my muscles. I told him that I had an MRI a few years ago and they found out that I had Degenerative Disc Disease in my lower spine and since then the pain has gone up to the middle of my spine. In fact, if you look at the image above, the red area is actually where my pain is. The top of the red area is the worst. He poked my back and of course I wasn’t in pain at all because I was sitting in the waiting room and in the exam room. I told him that the pain is usually when I am standing or walking for more than 5 minutes. I described the pain by motioning my hand as if I were repeatedly stabbing someone in the spine. I’ve never been stabbed repeatedly so I don’t know exactly how that feels, but I do know that my back hurts a lot, so I can just imagine that is what it feels like. We went to Truxton Radiology and I had many x-rays taken. The x-ray technician told me it would be up to 4 days, but I told her that I won’t see the doctor for 4 more weeks so no rush. Besides, I’ve been dealing with this pain for many years, so another 4 days isn’t going to hurt me. My pain first began in 2000 when I would bend over to pick something up and my back would literally lock up. I would be stuck in the bent over position because I could not straighten my back. After grabbing something to keep from falling and almost screaming from the pain, I would stand there for a minute until it unlocked and I was able to stand up slowly. That happened in front of my aunt and uncle in Palmdale in 2004 or 2005, I forget when exactly. I had pain in the lower part of my spine, but it was nothing compared to what it is like today. 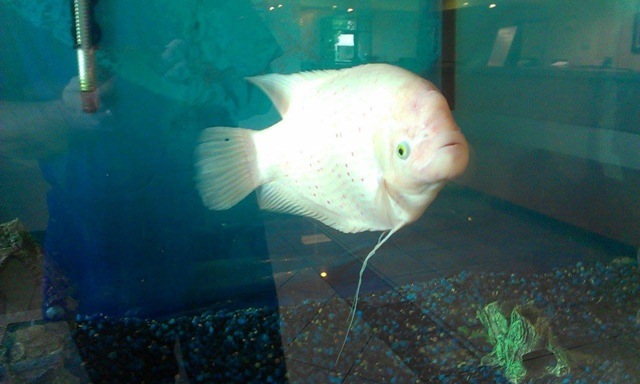 Just before I went to get my x-ray I saw this humungous fish in a very large fish tank by the back door. My first thought was holy cow that’s a big fish. As I left, I took my phone out to take a picture, but first I reached my finger to the tank as if I were petting him, or the tank, and he rammed the glass while trying to chomp my fingers off as if they were inside the glass. Holy crap that was an aggressive fish lol. I pulled my hand away and he was looking straight at me. He wouldn’t look at anything else, so to get him to turn so I could take the picture I had to put my right hand out to my side so he would turn his body. 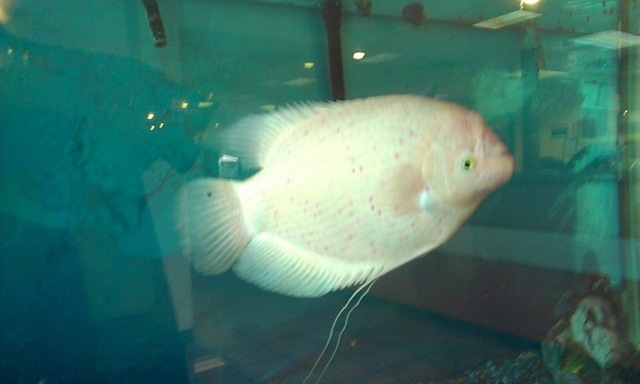 Here are 2 pictures of the fish below. You can see my reflection in the glass so you can use that as a scale. Anyway, now I am finally getting my back pain taken care of. The doctor said that the x-rays will determine whether I will need another MRI, but in the meantime he is going to call Truxton Radiology where I had the original MRI for those results. I don’t know what they can do, but at least they will see where the problem is and possibly give me a brace or maybe injections for the pain. I’ve seen the commercials for that exercise machine where you are upside down which helps to replenish your discs, so perhaps I will get something that is equivalent that is more affordable. Who knows for sure. I will keep this blog updated on that.